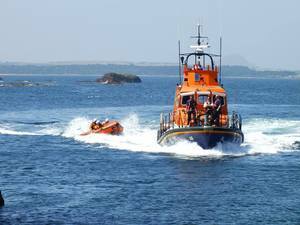 Dunbar’s lifeboat crews raced to rescue an injured kayaker after receiving a mayday distress call on Thursday evening (May 17). UK Coastguard requested both the inshore (ILB) and all-weather (ALB) lifeboats launch at 8.15pm after the call came that the kayaker had dislocated his shoulder and was stranded about a mile offshore from the town’s East Beach. The volunteer crew of the D-class ILB Jimmy Miff launched from Dunbar Harbour soon afterwards and located the male casualty and his female companion, both in their 40s, a mile north east of the harbour before 8.30pm. They found the man in the water, lying over his kayak, clearly suffering from a shoulder injury. The crew carefully lifted the man into the lifeboat, secured his kayak and made their way back to the harbour, requesting an ambulance crew meet them on their return. The female kayaker was able to make her own way back to the harbour. The crew arrived back at the harbour at 8.43pm, where the man was able to walk to waiting medics to be assessed. The ILB was then recovered, refuelled and made ready for service. Meanwhile the ALB also launched from its mooring at Torness Power Station and was on its way to the casualty before being stood down ten minutes later by UK Coastguard.